Somehow or other, rock-climbing has come up in a few different conversations recently. I respect people who want to try that, but I’m not one of them. But when I do find myself with any urge to climb a mountain, I have a favorite go-to book I pick up instead. I want to begin this review by saying that I have never been mountain-climbing. Nor do I ever plan to go. The truth is, I don’t even like steep hills (which, believe me, can be a problem if you live in San Francisco). I can walk very happily for miles on flat ground, but give me a hill and it’s all over. But this is why I love books. I love that they let me live lives I would never actually live, whether that involves casting magical spells, visiting a distant planet, or climbing a mountain. That last brings me to Banner in the Sky by James Ramsey Ullman. You’ll notice I have a picture of Third Man on the Mountain. Walt Disney changed the title for his movie version, and then they reprinted the book with the new title. I like Banner in the Sky better–for one thing, I’m not sure what Disney’s title is even supposed to mean! With either title, the book is about Rudi Matt, and about the Citadel. Rudi is a teenager living in a small village in the Alps in the 1800s, and he dreams of climbing the Citadel. It’s the one unconquered peak, the one no man has ever reached the top of. No one has tried for years, since the failed expedition that killed Rudi’s father. Rudi’s mother has forbidden him to become a mountain climber (and I do understand her viewpoint!) but when an Englishman comes determined to lead an expedition up the unclimbable mountain, Rudi is determined to go. The book is as much about Rudi’s growth as it is about the mountain. He learns that there’s more to climbing a mountain than just scrambling over rocks, learns about things like trusting others and never leaving a comrade. He learns to follow his father’s footsteps in more ways than one. 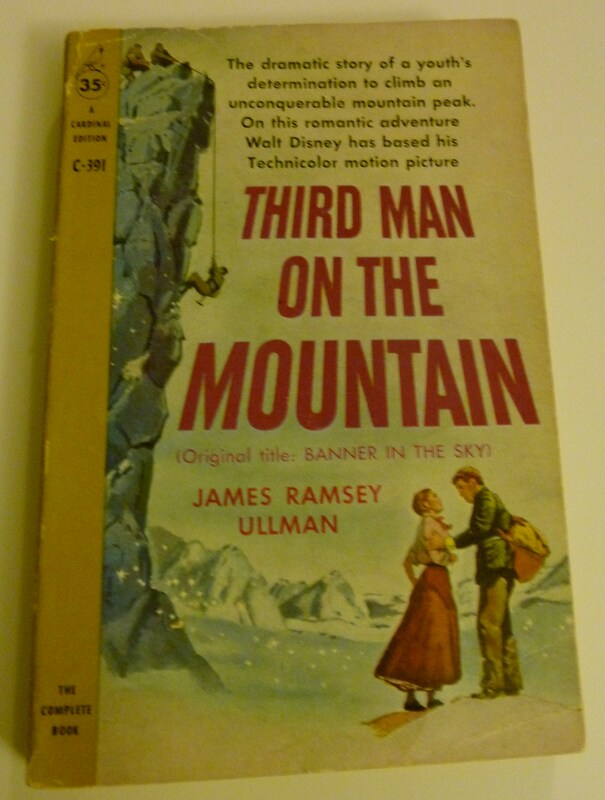 My best guess on Disney’s title is that Rudi becomes a man on the mountain, rather than a boy–but I can’t quite figure out how Disney calculates him as the third one. This makes it all sound like it’s deep and reflective, and occasionally it is–but there’s also plenty of scrambling over rocks, and getting caught on ledges, and even an avalanche or two. It’s an exciting story as well as a meaningful one. It reminds me a little bit of stories about Scott’s expedition to the South Pole. Not because of the snow similarity, but because they’re both about men trying to achieve a feat that has been considered unachievable. They’re about pursuing the impossible dream. And while I personally don’t have any desire to climb a mountain or ski to the South Pole, when the story is told right, I can get very enthused about someone else’s dream. Why does someone climb a mountain? “Because it’s there” is always a good answer. Because it’s there to be conquered. For Rudi, it’s because he wants to take his climbing staff and his father’s red sweater, and plant them as a flag at the top of the Citadel–a banner in the sky. Even though I need a good reason to climb a steep hill and can’t imagine climbing a mountain, Banner in the Sky makes me believe in Rudi’s dream, makes me see it as vital and important for him, and makes me want to see him succeed.